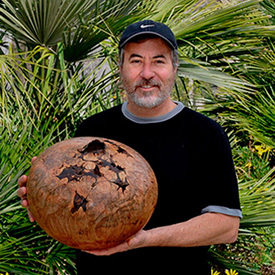 Mike Jackofsky, USA, specializes in hollow forms, most of which are natural edge pieces made from unique burls. He also turns bowls, including thin natural edge bowls, asymmetrical pieces, including hollow forms with "wings" and also lidded containers. His classes will emphasize the hollowing process, from turning the shape between centers and mounting in a chuck, to hollowing the form and reverse chucking the bottom to complete the piece.